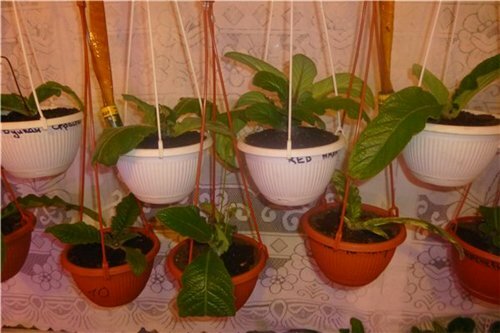 Some people grow streps under the artificial lights. 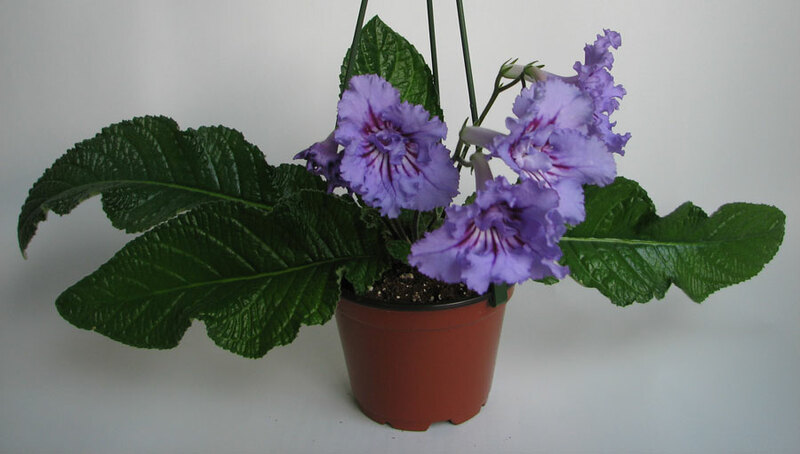 Some grow under natural light and use artificial light only as a bloom booster during winter months. Some “privileged persona”, like Pavel, have green houses. 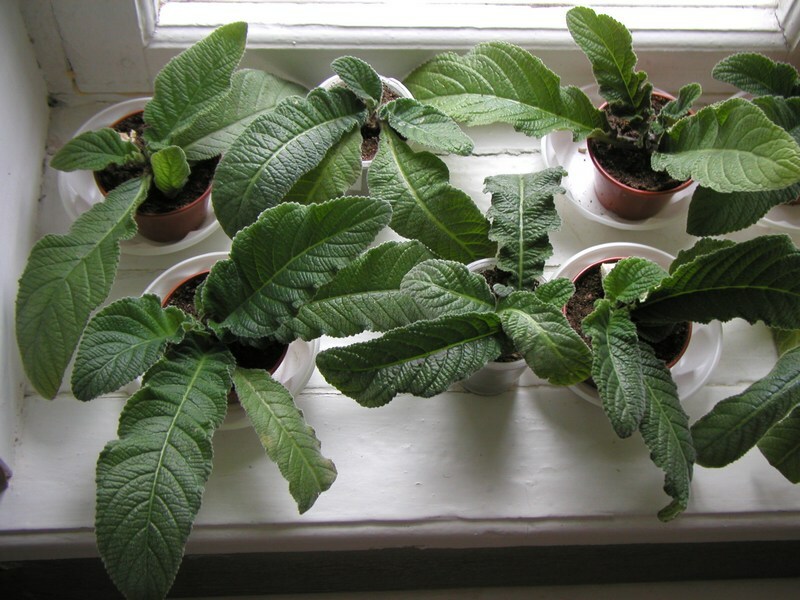 Most people grow their plants on the windowsill in “spartan conditions”. 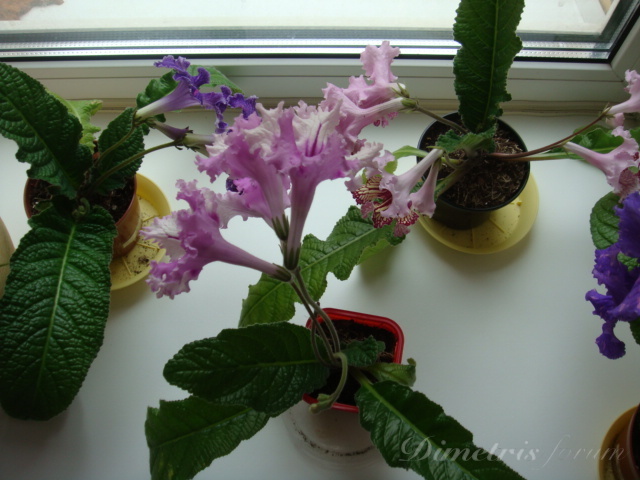 Pavel initiated this thread to organize information from people who grow streps this way. 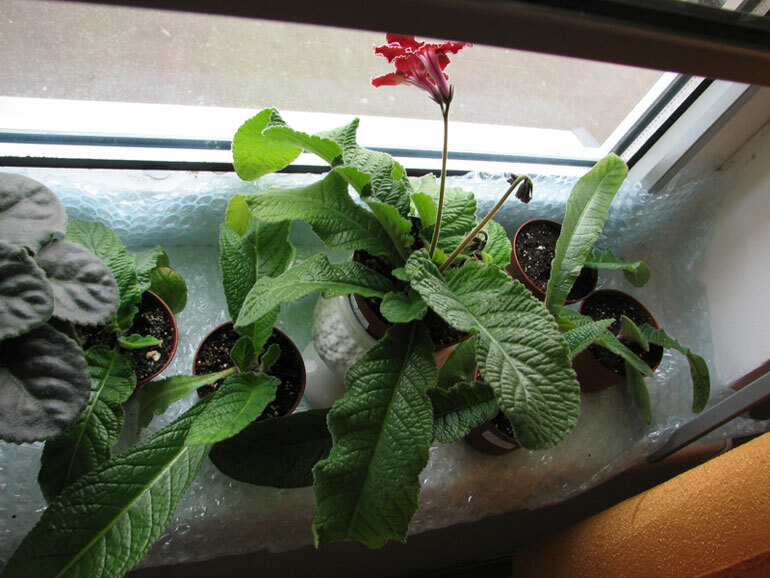 He also decided to start to grow some of his plants on his windowsill. Pavel: “Some people thinks that streps need special lights and humidity to achieve their full potentials. It is not the case. I allocated one room that I use for quarantine streps. It has two east windows. 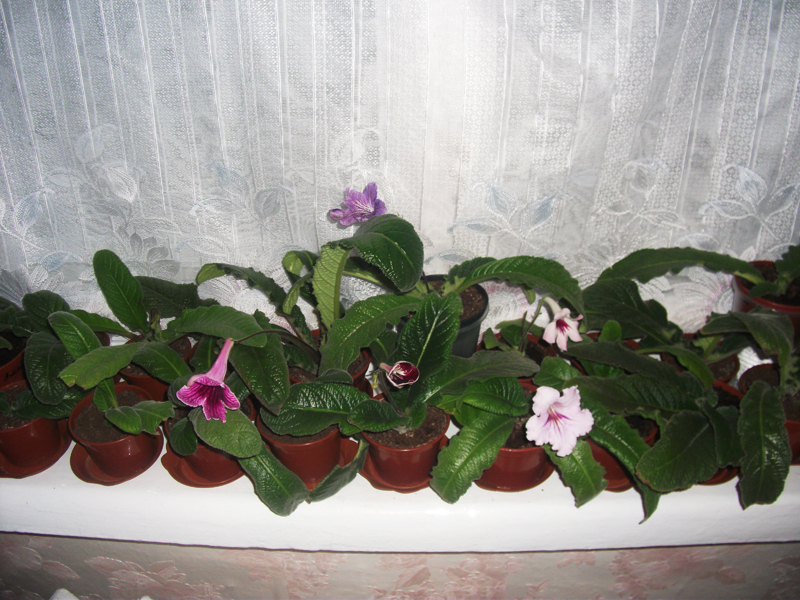 I wrapped hot radiators, that are underneath windowsills with insulating materials to protect plants from heat. We have one window partially open all the time even in cold winter months. Streps are not afraid of cold draft. The temperature is 13 C (55 F), humidity is 23%. 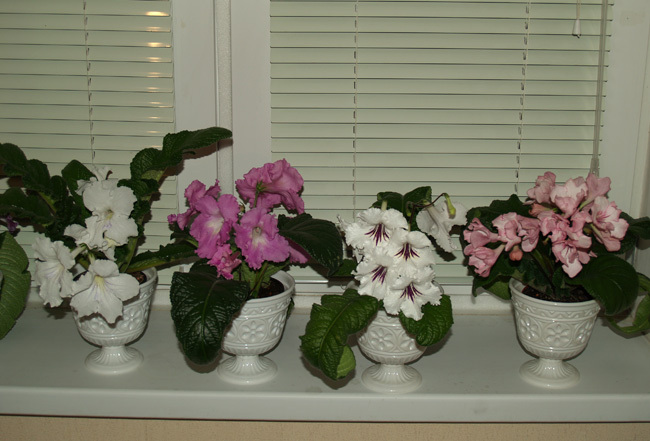 I selected five plants for that: two DS-Margarita, two DS-Crystal Lace and one DS-April. 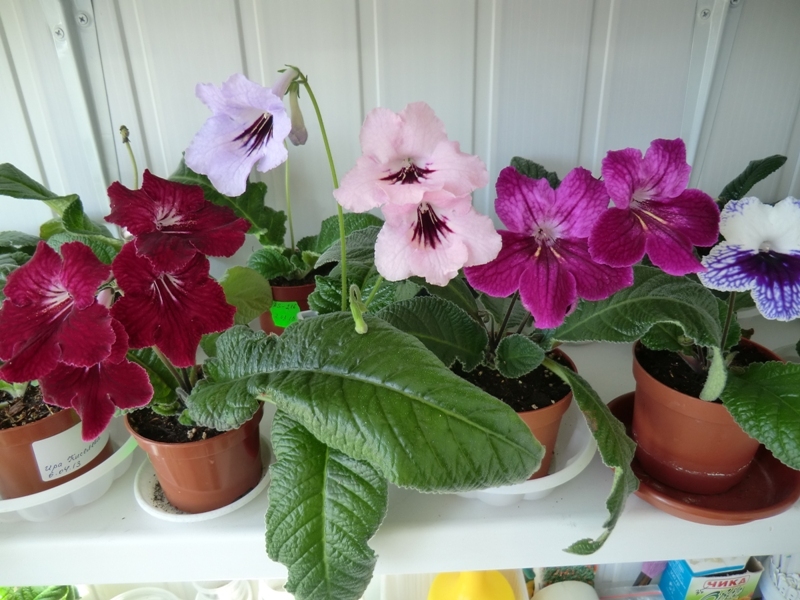 I planted them into larger pots 10 cm (4”) than I normally do [8 cm (4”)]. 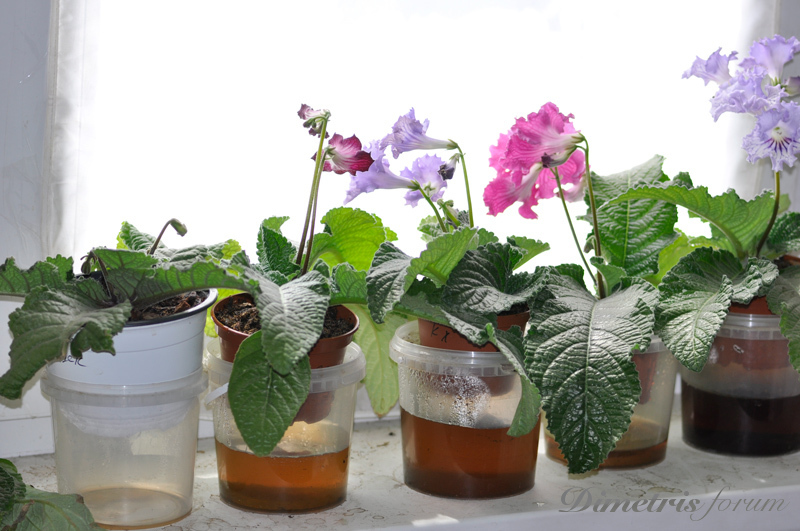 I re-potted them into two different experimental soils that (I hope) will allow me to grow plants in larger pots without risk of root rot. 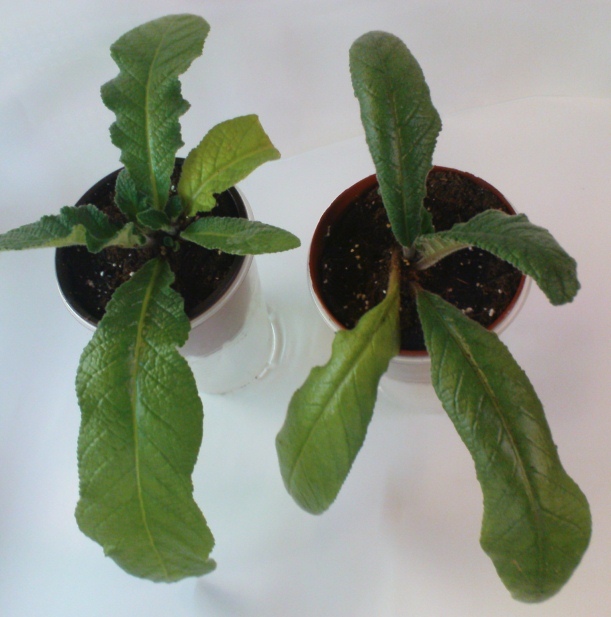 It will lengthen the time between transplantation. The light fabric on the window served as a screen in hot summer months. I will remove it now and put it back in spring. " 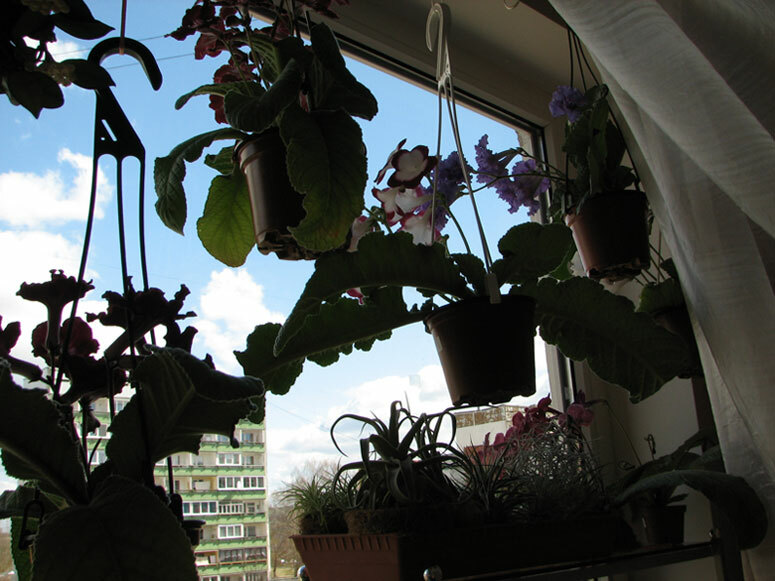 Pavel: “I propose that everybody who is participating in windowsill marathon start preparation now. Daylight is getting longer and it is still cold. 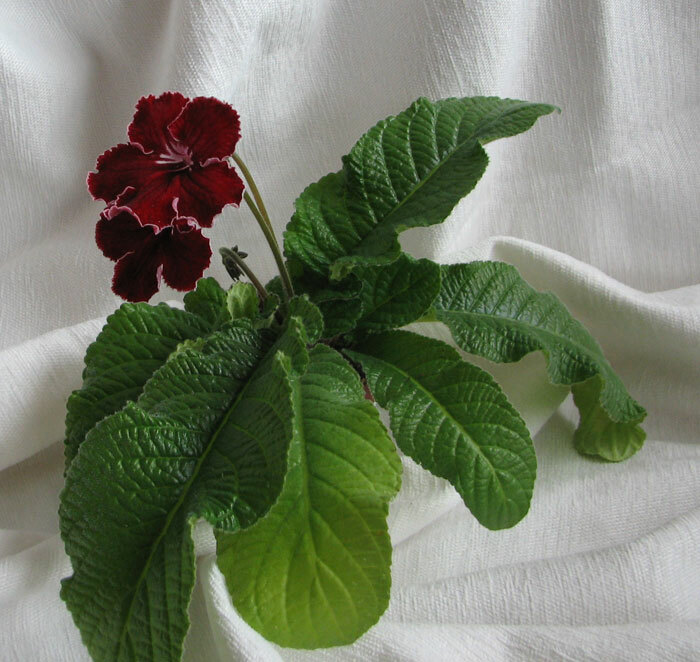 It is a good time to rejuvenate plant: remove old leaves, suckers. 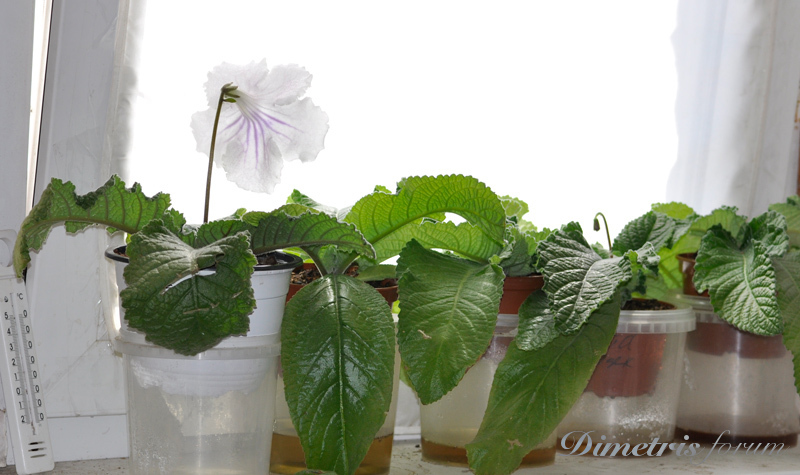 It is desirable to rejuvenate root system too. 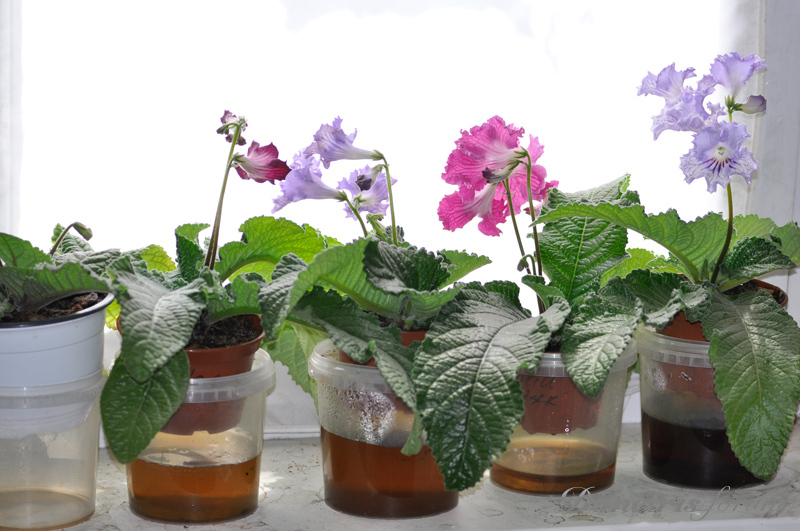 Depending on root system condition some plants might need to drastically renew their roots, others only partially. 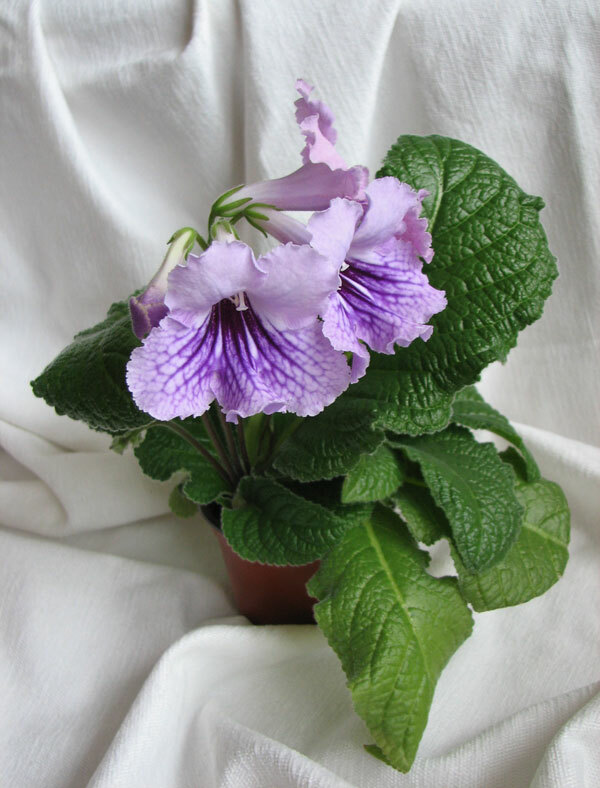 Good new soil is paramount for growing new strong leaves which, in turn, are important for abundant spring flowering. 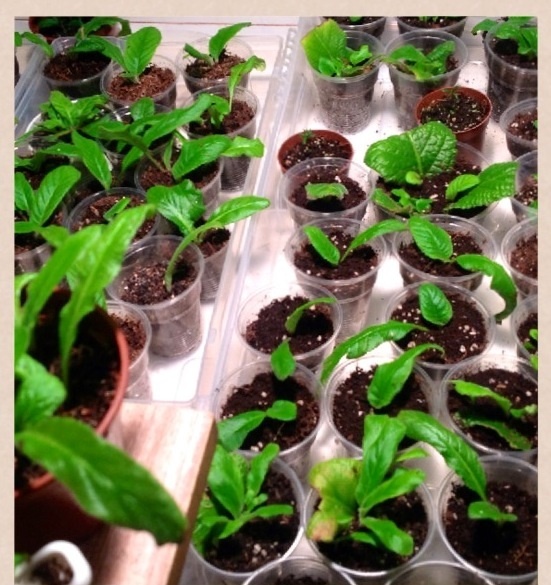 If you plan to experiment with babies, transplant them to good airy soil. Please join us. 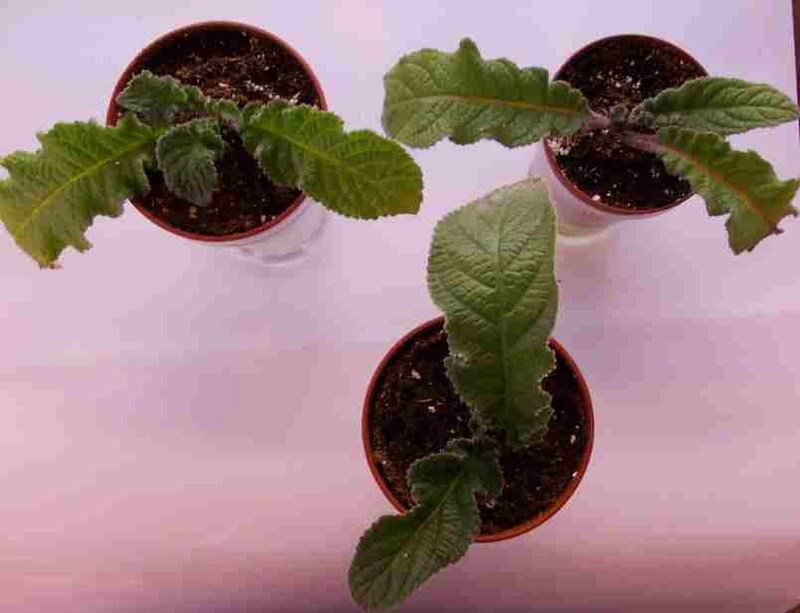 It does not matter whose plants are better. 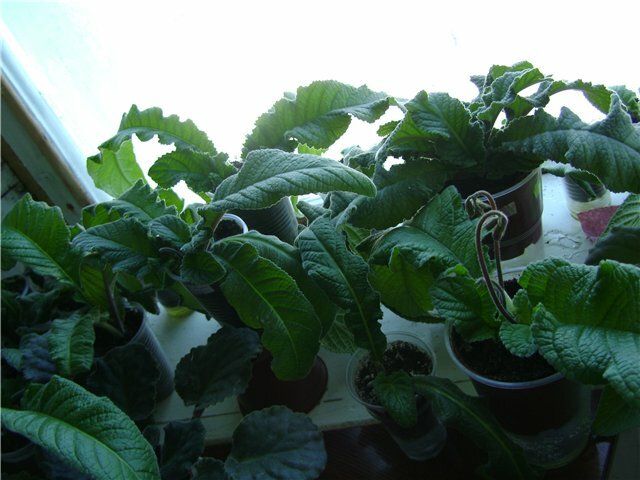 I know that every plant will start blooming in spring. Let’s show people that streps are very grateful. Let’s show how they will transform from ugly ducklings to the beautiful swans. I propose to photograph the following steps. 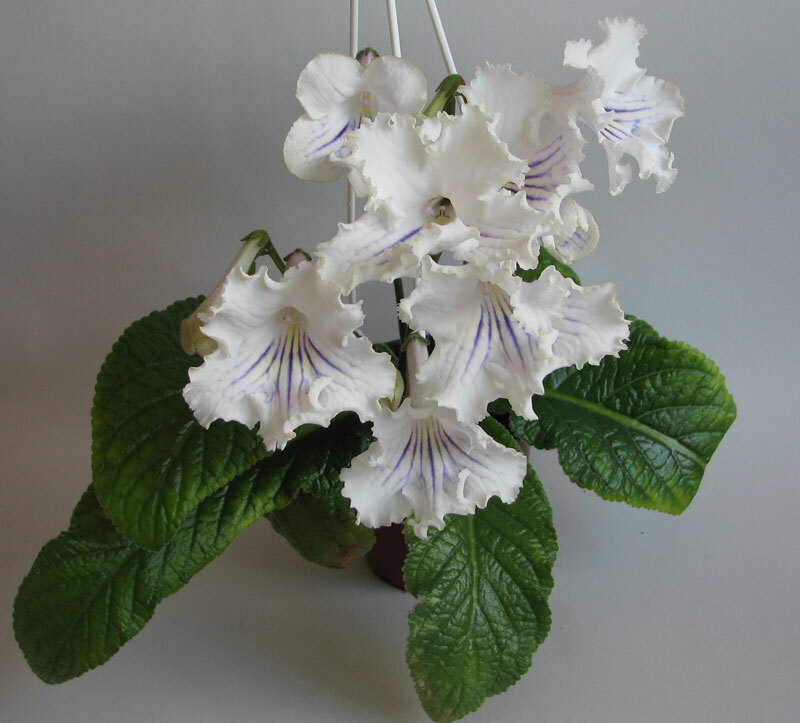 Svetlana: “Great subject, especially for newbies like me. I look every day at my starvelings that are getting worse and worse. I thought that something was wrong with their root systems. When I look at it - there is no soil left. Should I toss them out and bury the thought that streps will like me one day? Do I need to remove part of the root system and further weaken the plants? 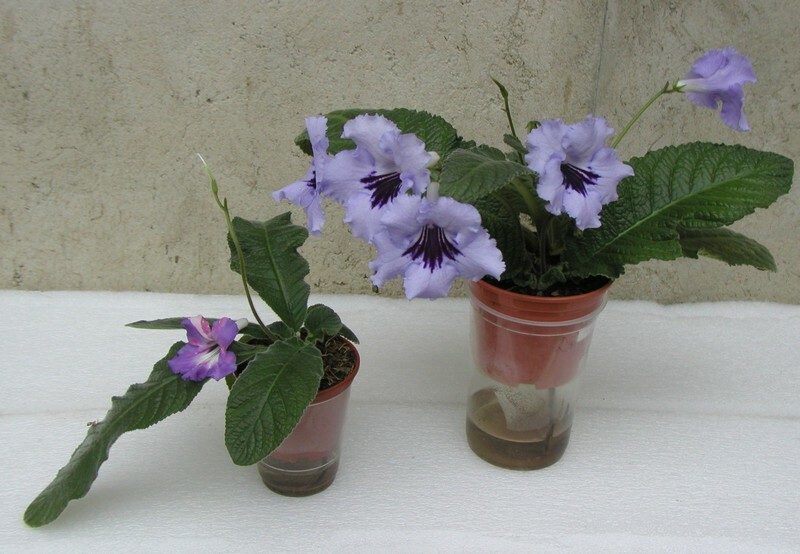 Should I re-pot to the same 8 cm (3”) pots?" Pavel: "I would partially rejuvenate root system especially because it use all soil." 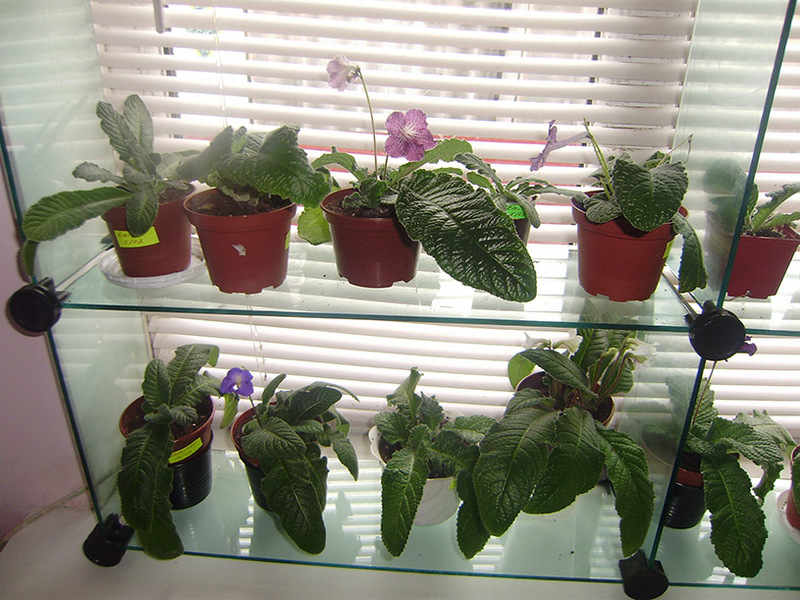 Svetlana: "Here is how my plants look like. 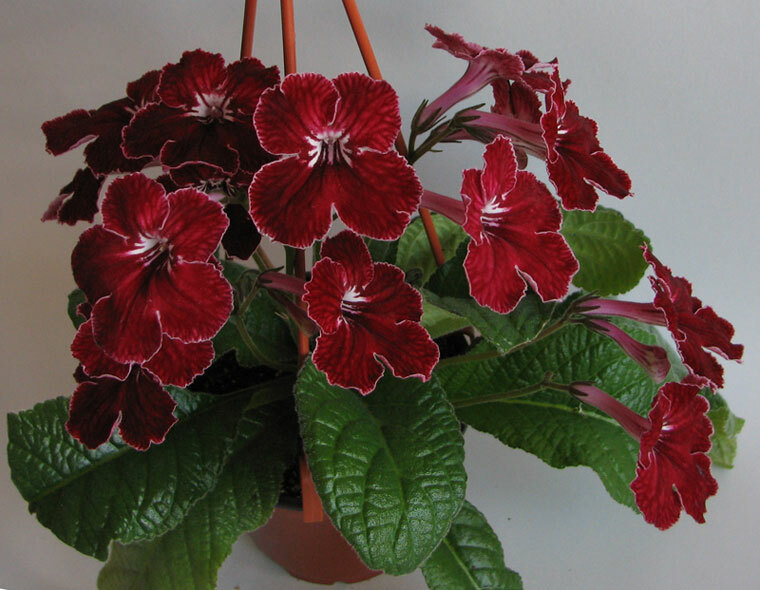 They did not loose turgor during re-potting and look good now. I do not know anything and will apprecialte any help." Here is another one. Do I need to remove that yellow leaf?" Pavel: "I would not do it." 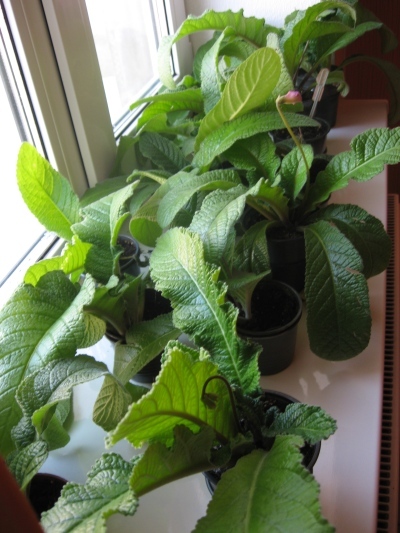 Svetlana: " Here are another plants." 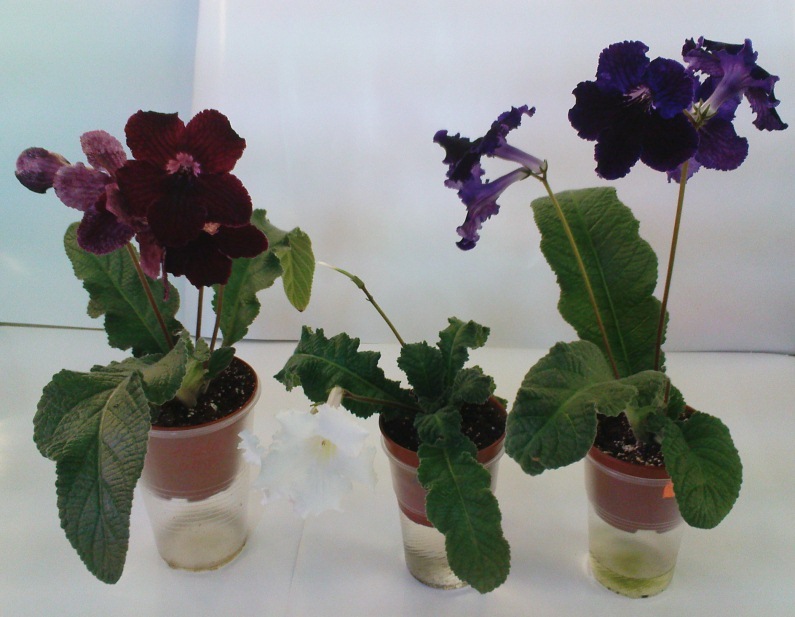 Question from forum: " Are we taking to this experiment only rejuvenated plants? What about babies from leaves." Pavel: "Personally, I like babies. 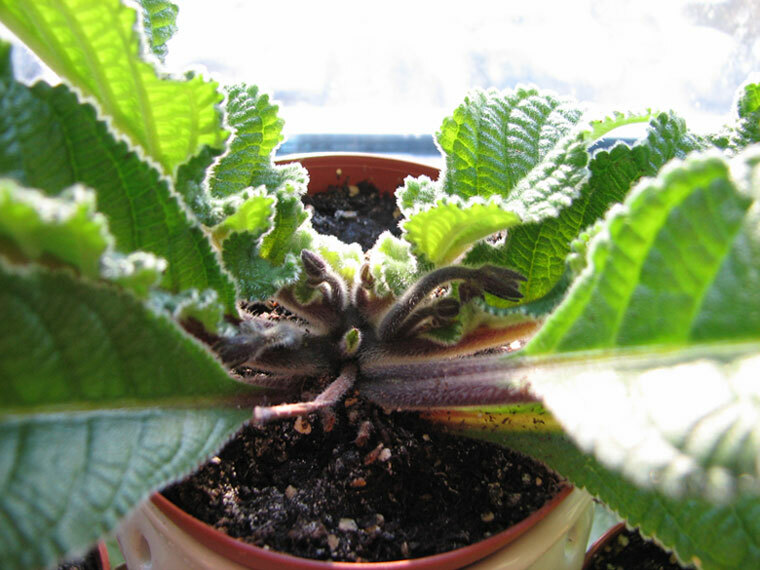 Among my five plants only one is rejuvenated one, the rest are babies. 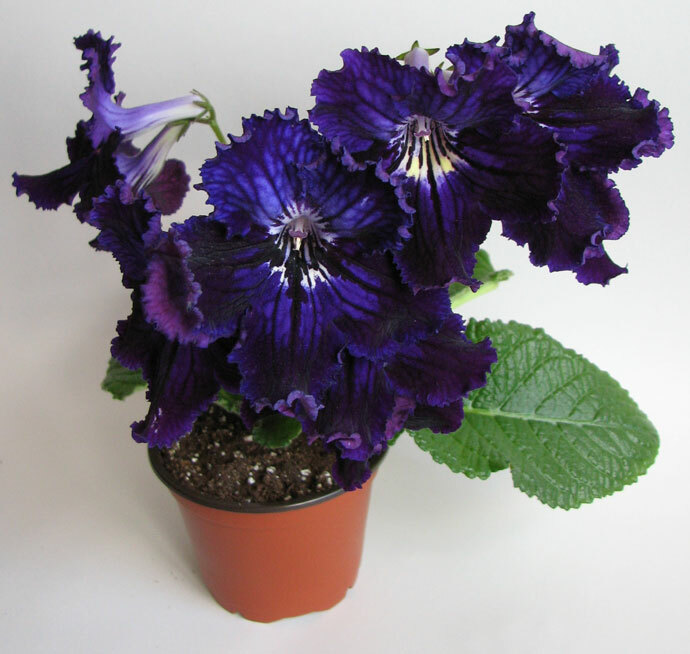 However, if you babies are very small you might not be able to get good lush flowering." Alisa: "I transplanted my streps on Nov 4, 2012. Their root ate up all soil, (wisp of root). 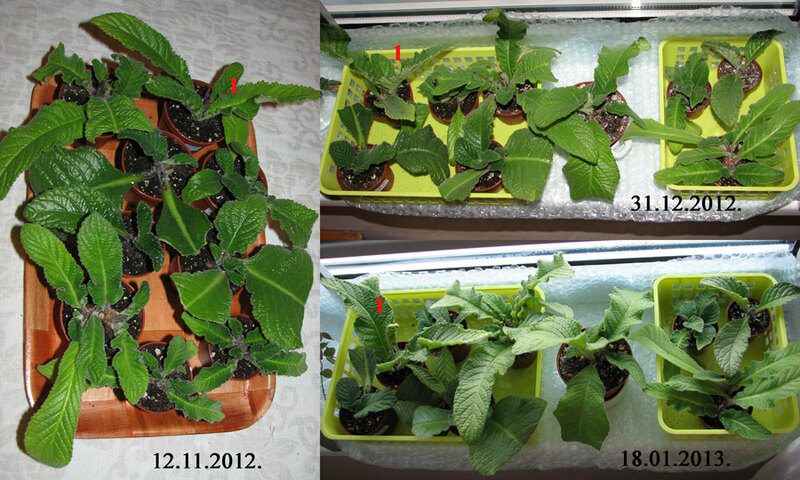 I did not have choice and remove a lot of root and old leaves and put back to 6 cm (2.5") pots. My window are facing North-East. Temperature there is 15 C (59 F) and Humidity is 40%. 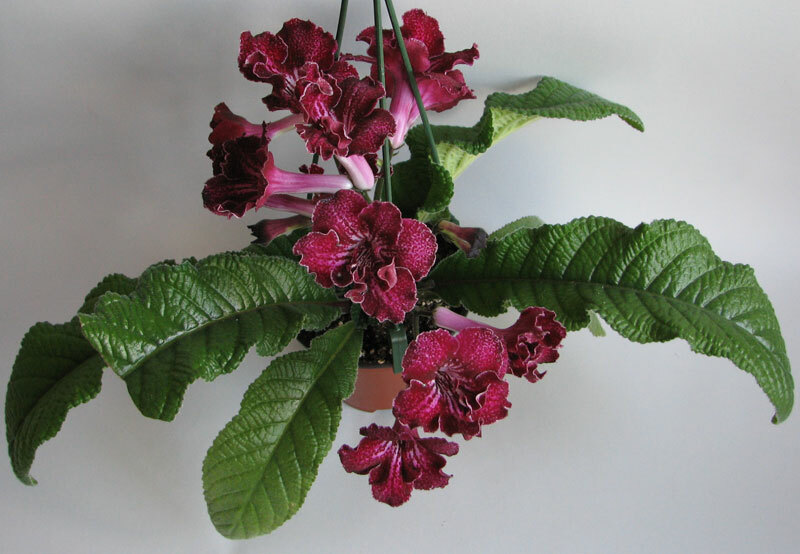 As you can my plants are dormant except one. I do not understand 13-15 C. It is Okay or a little cold for the streps. When I touch pots they are cold. I can't belive that their roots are growing. I afraid to loose them. May be I have to give them additional light? 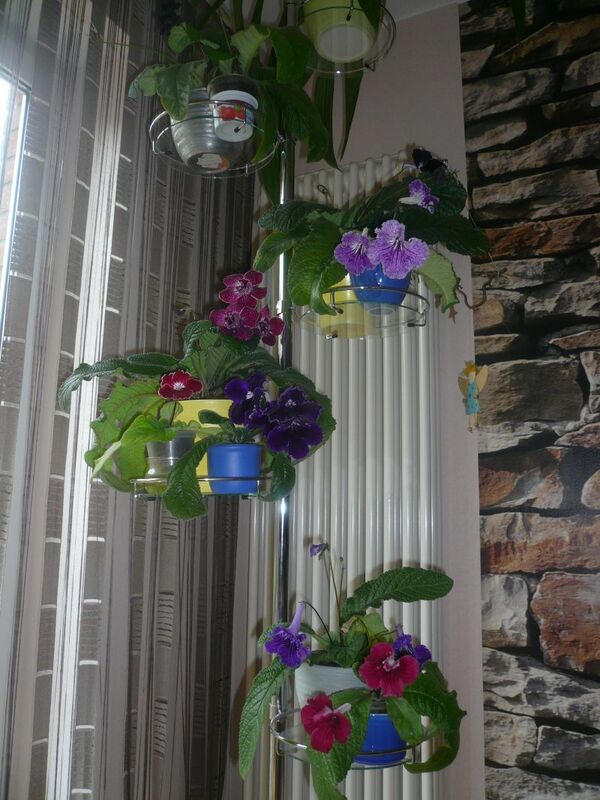 I also think that I will not re-pot them until February. 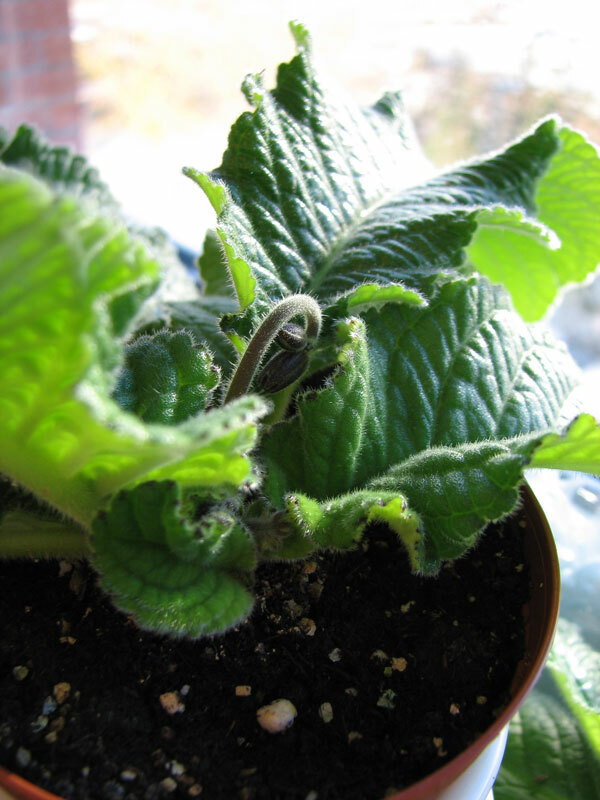 It will be three months since last re-potting." Pavel: " 13-15 C is good for streps in winter. I think you are right. 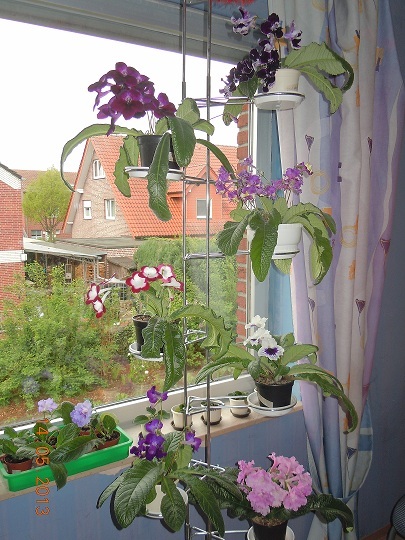 Only I think that your plant are too crowded." Jan 24, 2014. SoNata: "I decided to join you guys. 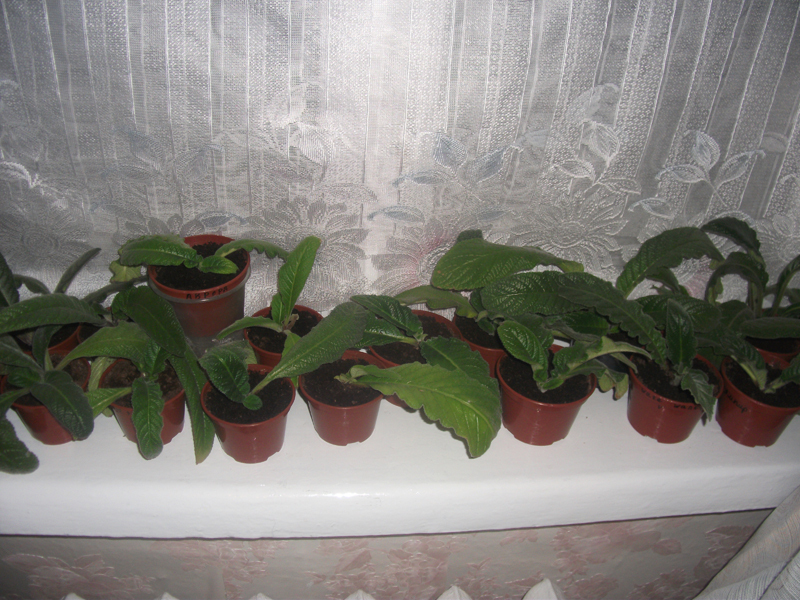 I've just transplanted my babies. It is a South window. Temper. 12-15 C (54-59 F). Dawn starts at 10:30, Sunset at 4:30. Armand: " These are mine. 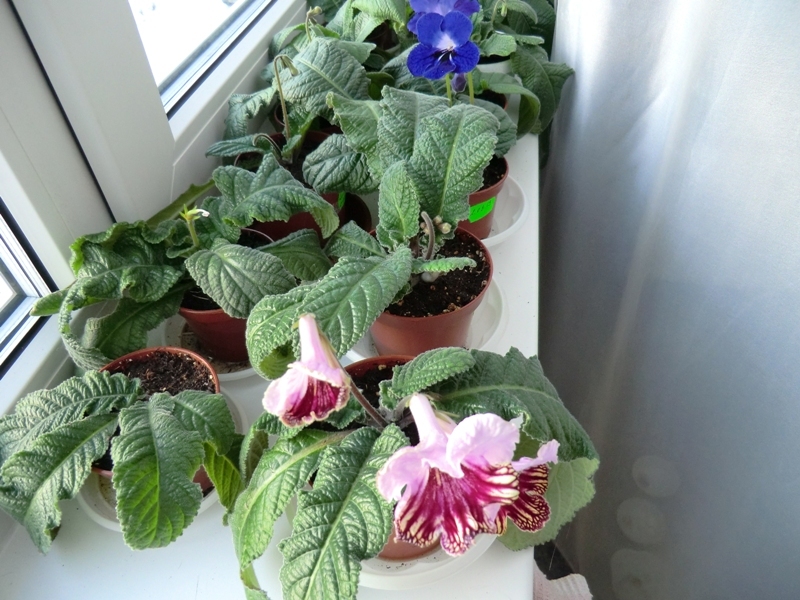 I re-potted them at Dec. 14, 2013. Today we have sun." 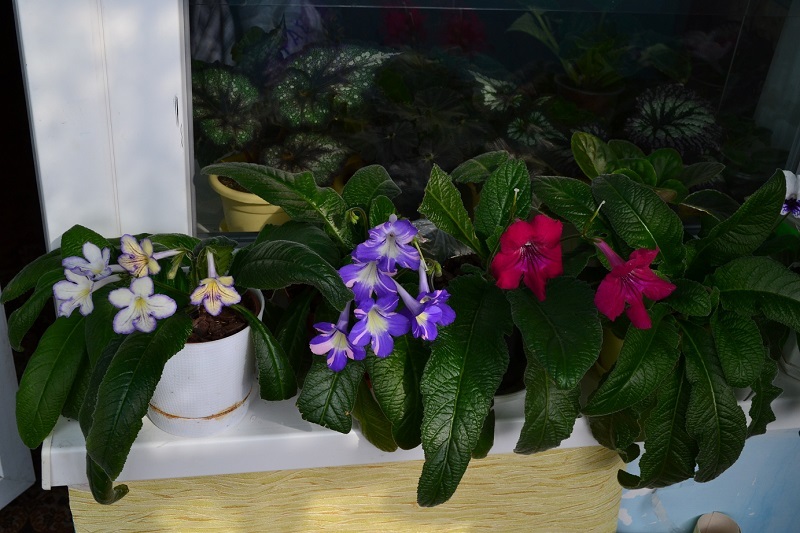 Nazan: “I decided to join windowsill marathon. My windows are facing west. Temperature is 14 – 20 C (57-68 F). One of the windows always slightly open. Here is photo from Jan 15, 2013. 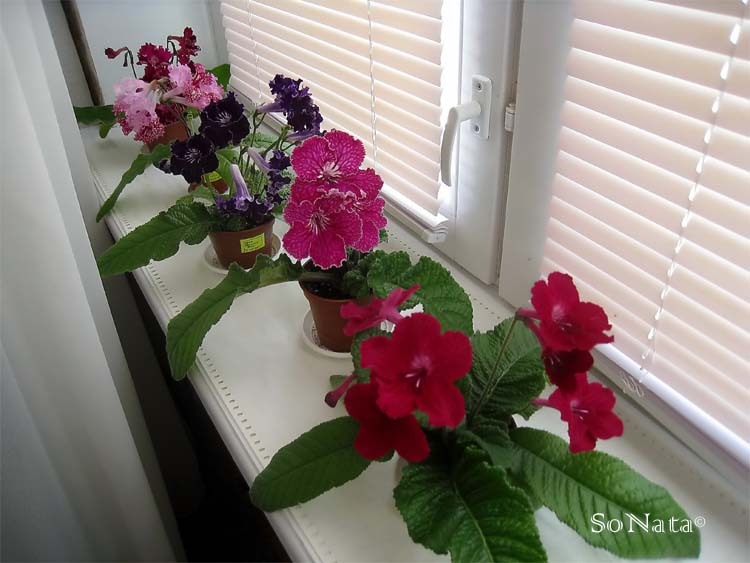 Row that close to the window, left to right: DS-Strawberry, DS-Owl, DS-Violet Moth, DS-Woman Logic, Gwen. Front row: Valor, DS-Hawaiian Party, DS-Crystal Lace, Roulette Azure. Tatyana: “ I want to join too. It is my kitchen. Temperature is 23-25 (73-77). Window is facing south. Yesterday I installed transparent curtain. I re-potted them Feb 14. I remove old leaves. Alisa: "Here are my plants today." Chocolate: "Unfortunetly, I found this forum too late. 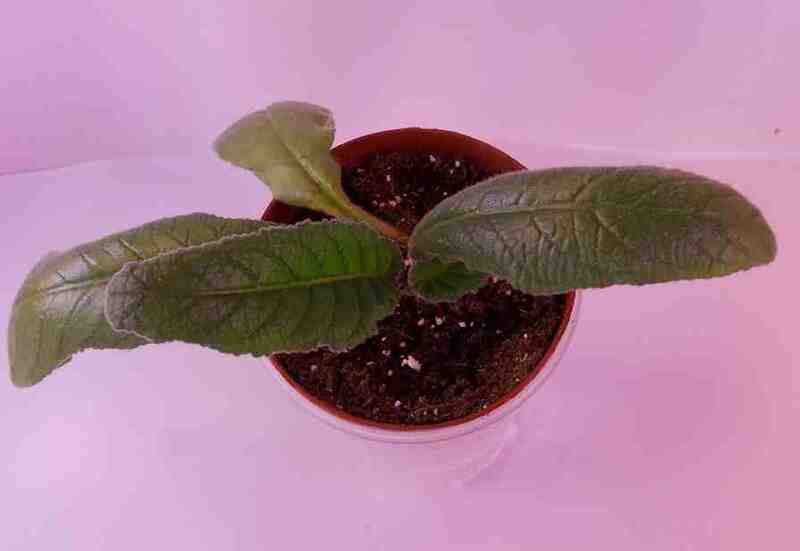 I transplanted all my streps in January. I removed some old leaves. I have North windows. 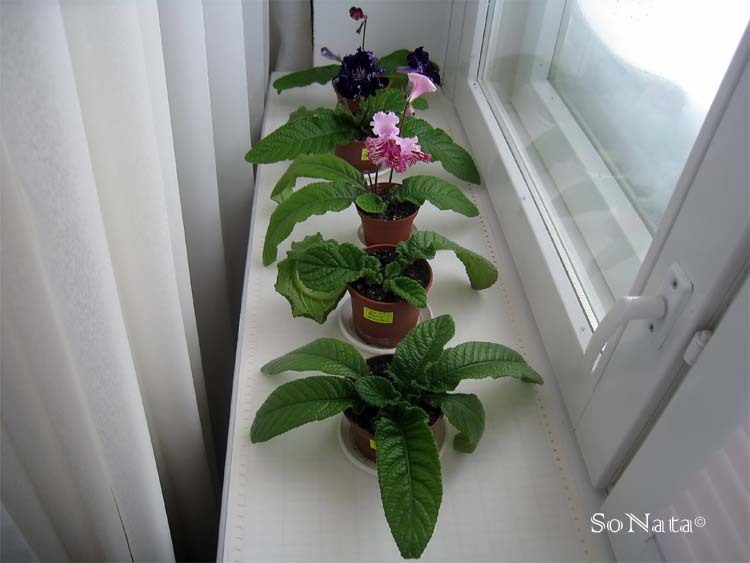 Temperature is 15-18 C (58-64 F) Under the window is very hot radiator. I am sorry , my images are not good"
Tatnih: "I have northern and eastern windows. 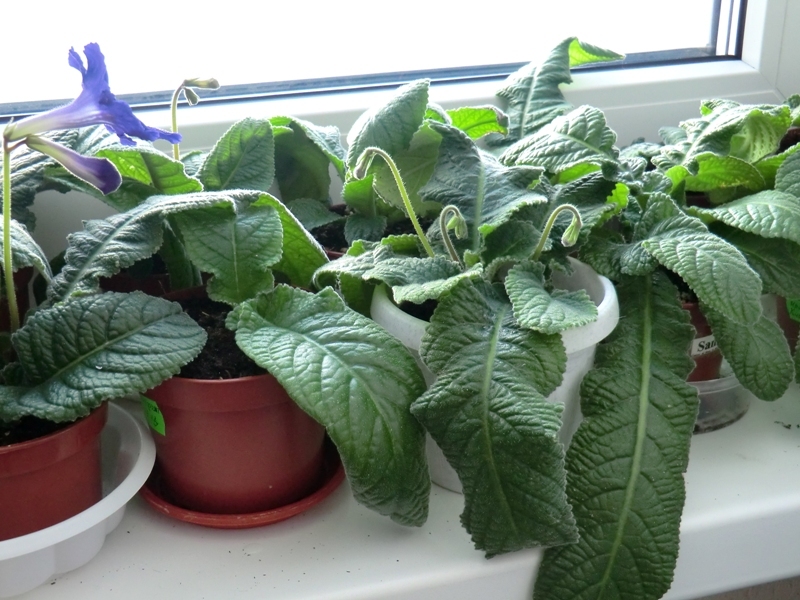 I re-potted them in the middle of February. I still did not add any fertilizer. What do you think, it is the time to feed them? 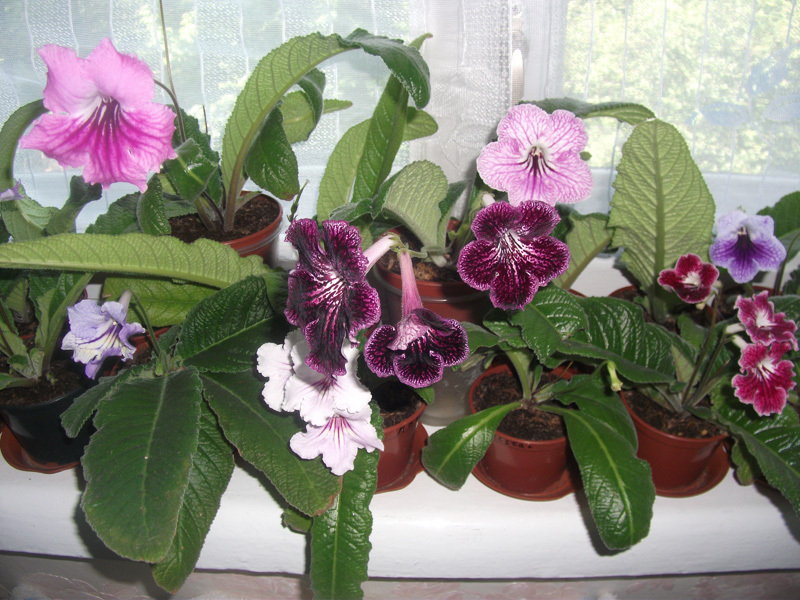 I also have these plants. 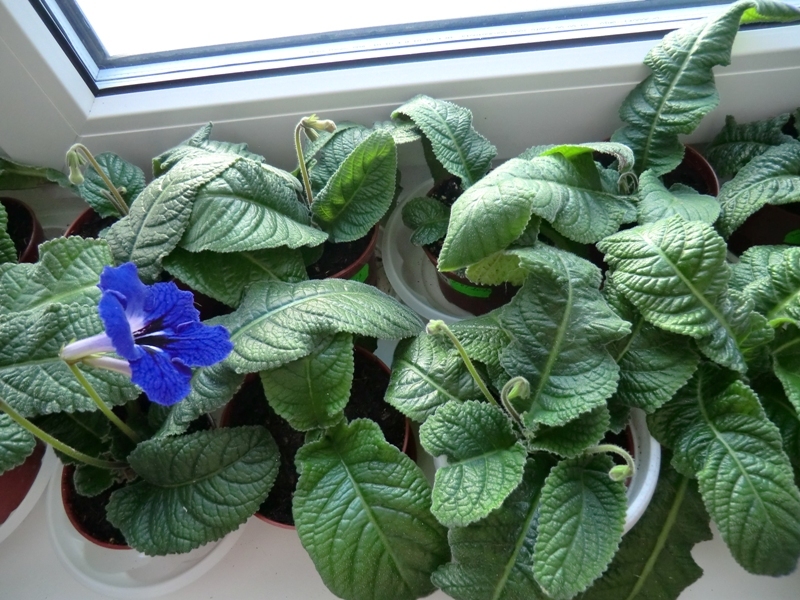 I transplanted them in the end of January. I week water them. Pavel: "My streps began slowly to show buds. DS-April still flowering. 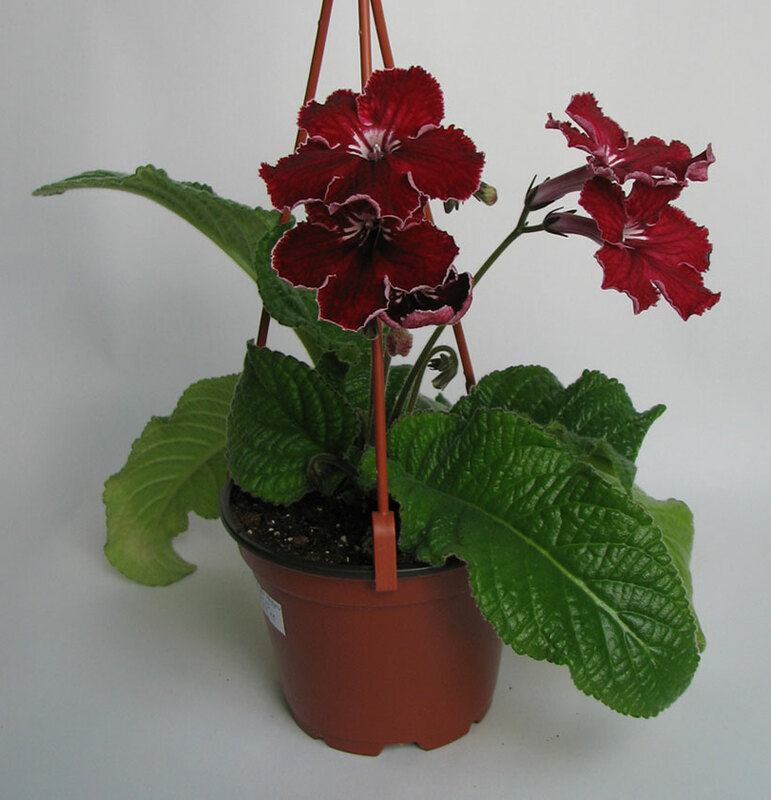 Flower size is 12 cm ( 5") Some grower think that streps can't have large flowers when they are grown on a windowsill. I don't think that it is true. 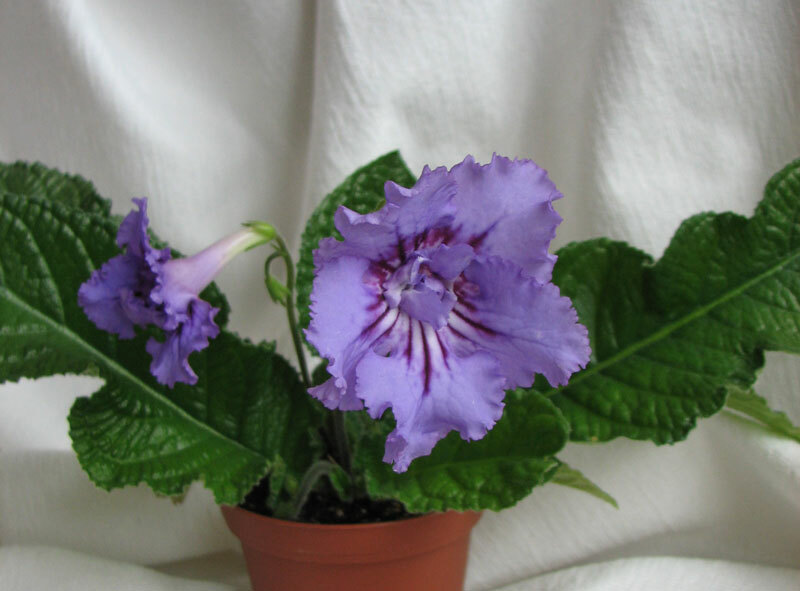 Size of the flower depends on the hybrid. Night temperature is 10 C (50 F). Day T= 15 C (59 F). We see more sun. Humidity now is 25-35 %. I started to feed them. Periodically I remove the suckers. I checked root system. Roots now are all over the pot. 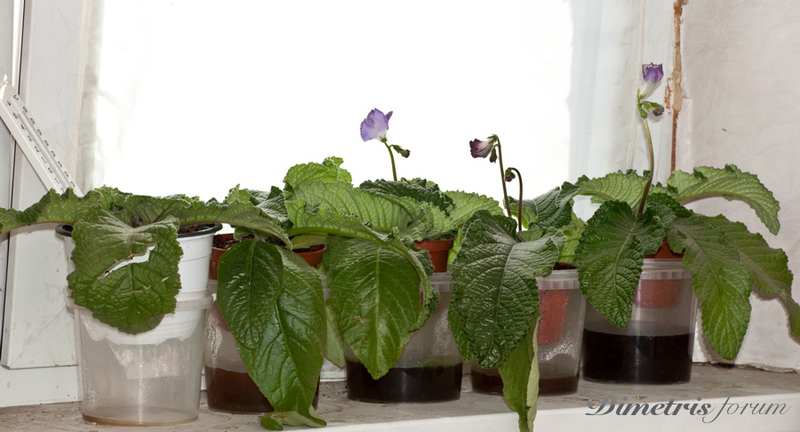 Result: Cold temperature does not inhibit leaves and root growth. 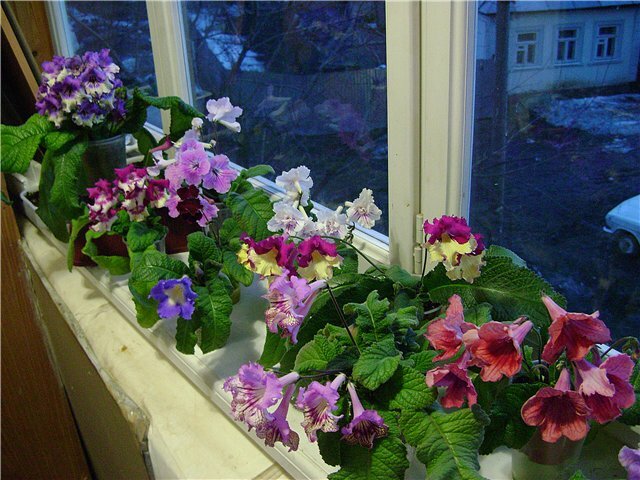 Ludok: "Finally spring came to my window"
Svetlana55: "Here are mine now. A lot of bud, some plant start flowering"
Tatmih: "My streps now. 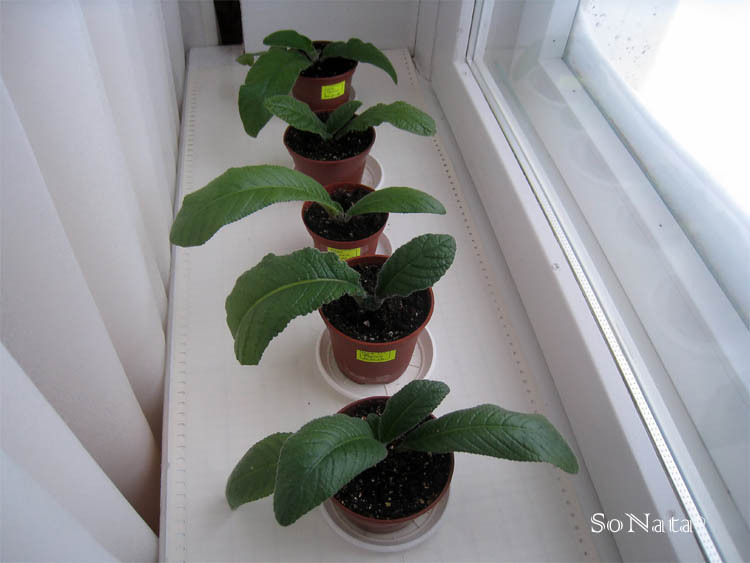 I change their position"
Pavel: " I suggest for everybody who participate in this experiment not change their position to see dynamic in their development (or put them to the same position when you photograph them"
Sonata: "First photo was taken three month ago. 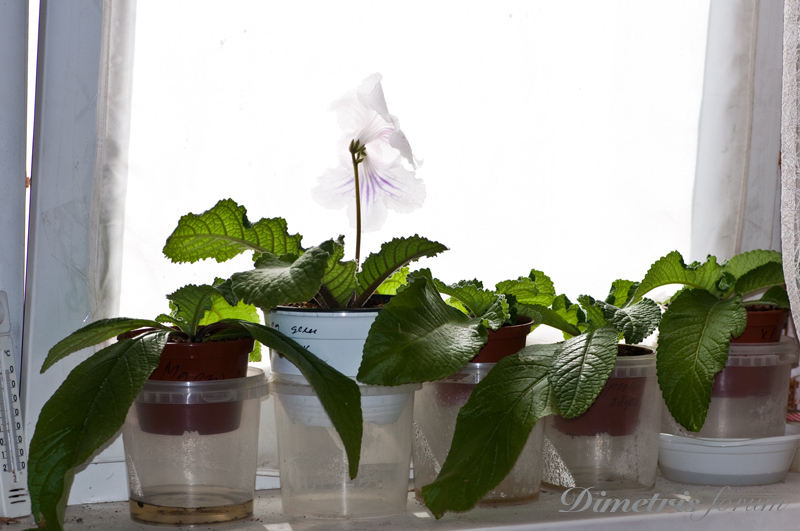 Surprisingly, streps on my window sill have more buds and flower than streps under lamps"
Pavel: "So far our experiments have shown that Streptocarpus tolerate and grow when humidity is low. Now relative humidity at day time is 20-30%, at night is 35%. I water them one in 2-3 days. 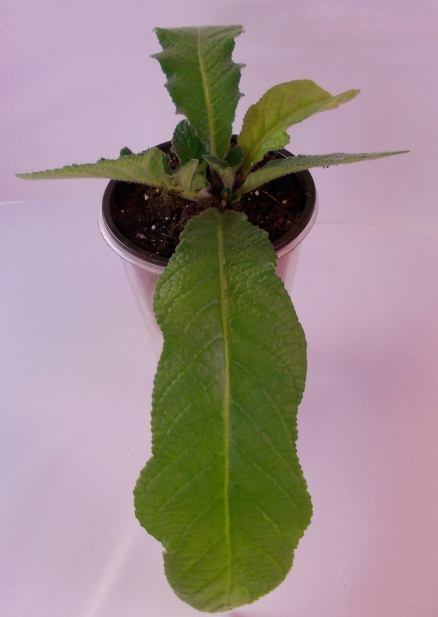 Leaves are firm and hairy which is adaptation to low humidity. There are no bacterial or fungi diseases. 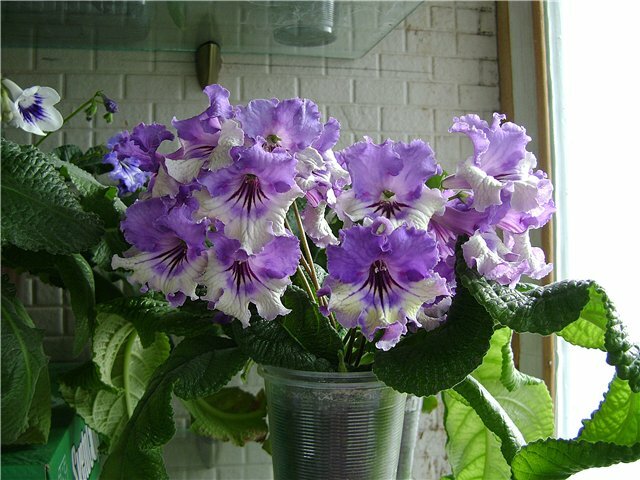 They have troubles to adapt to low humidity. I also was experimenting with different pot size. Difference is not significant. 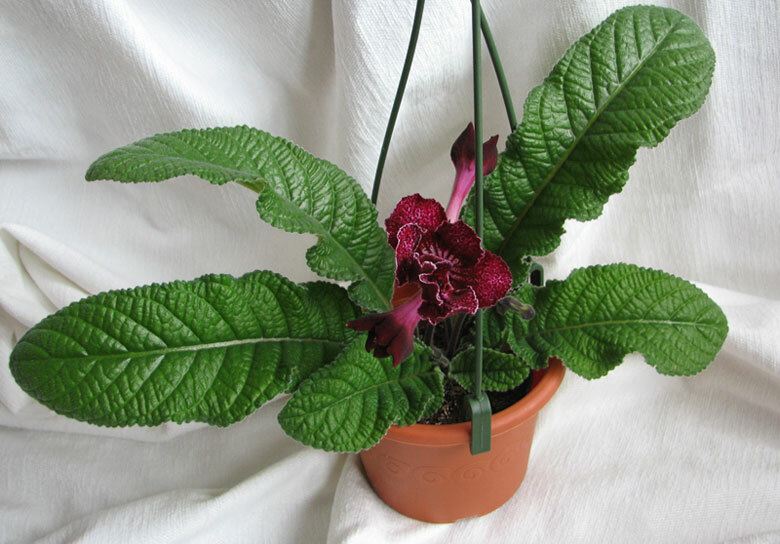 I have noticed that in small pots buds appeared a little earlier than in larger pots. 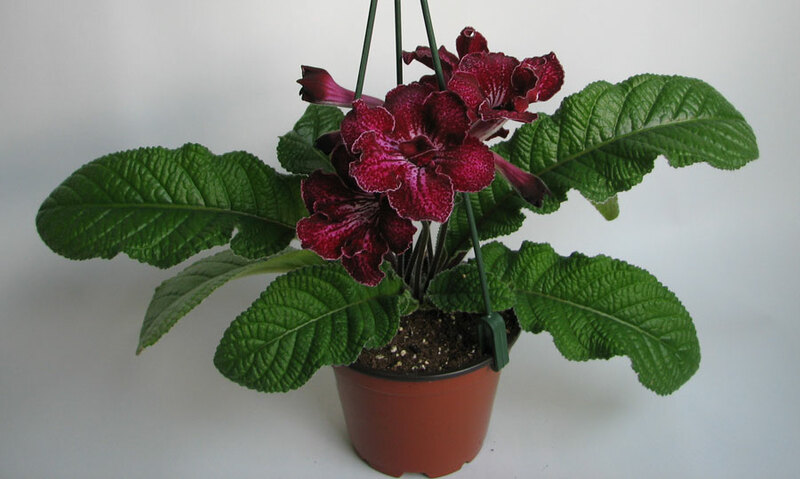 Foliage looks a little thicker in larger pots. 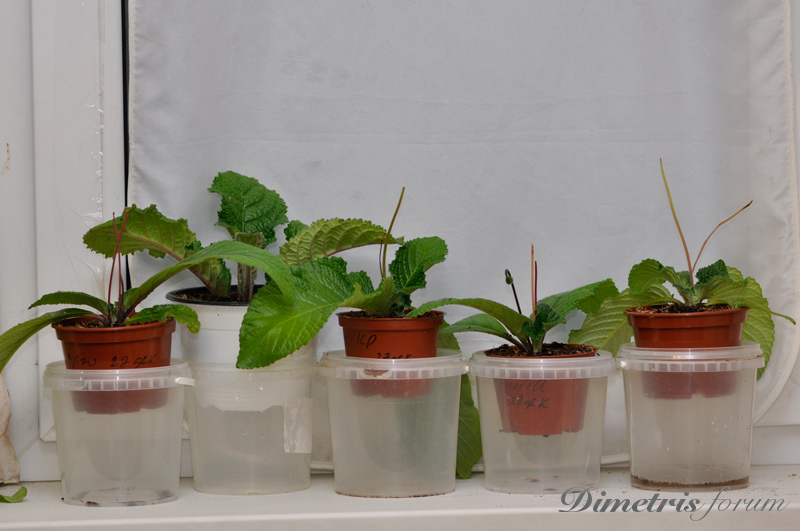 In smaller pot soil drys much faster. So, I need to water more frequently. I put one plant to very large (for this plant) white pot. In this case everything looks much worse. Root system is week. Rosettes and flowers do not look good either. Result: Disproportionately large pot (white) is bad. 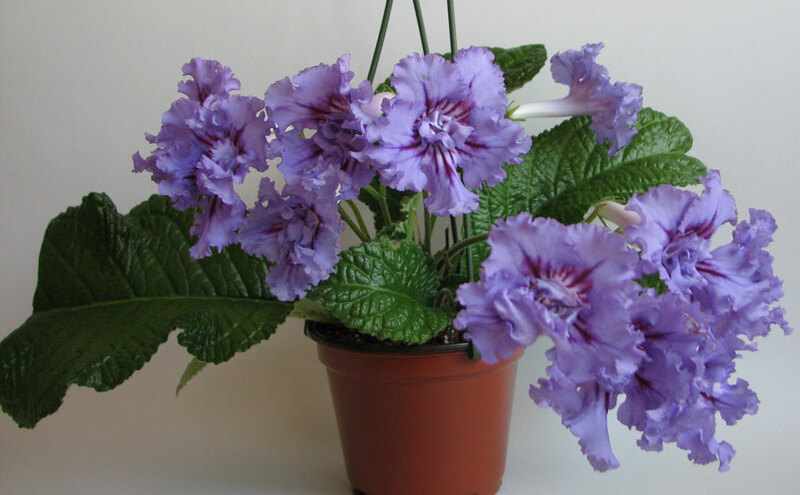 Very small pot stimulate early flowering but require frequent watering. So, optimal pot size in my case appeared to be 11 cm (4.5"). 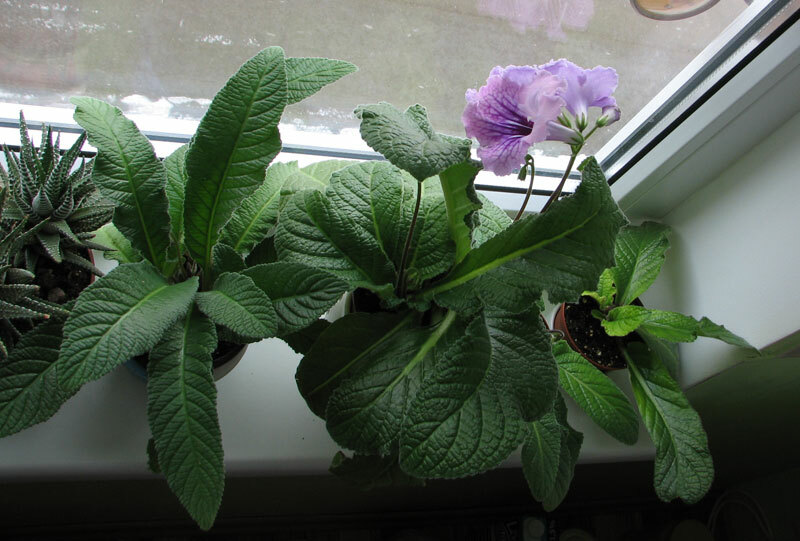 Today May 04, 2013 Pavel: "Plant is large (white) pot did not grown as well as in small and medium pots"
SoNata: "Now I feel more confident about growing streps. I am very surprised. 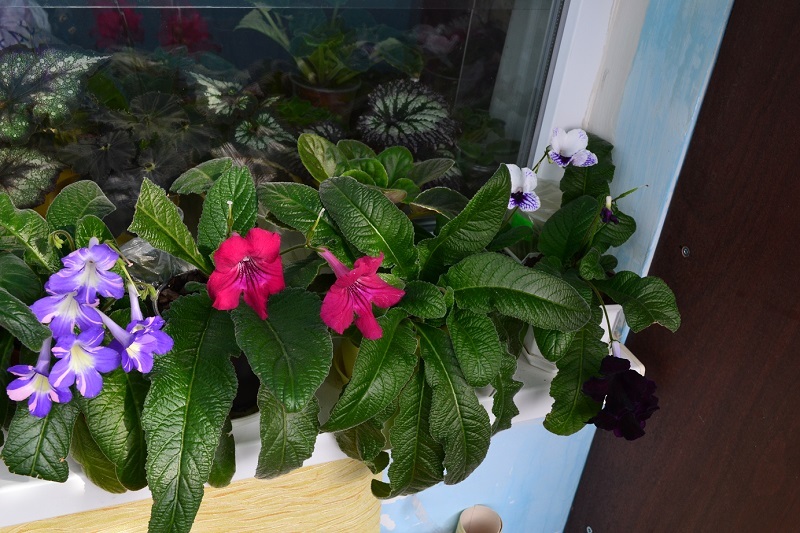 I expected that some streps will get frost bite on the cold windowsills.I surprised even more because my streps on the windowsill without any artificial light started blooming earlier that my streps under the artificial light. " Anatolevna: "I was surprised too. 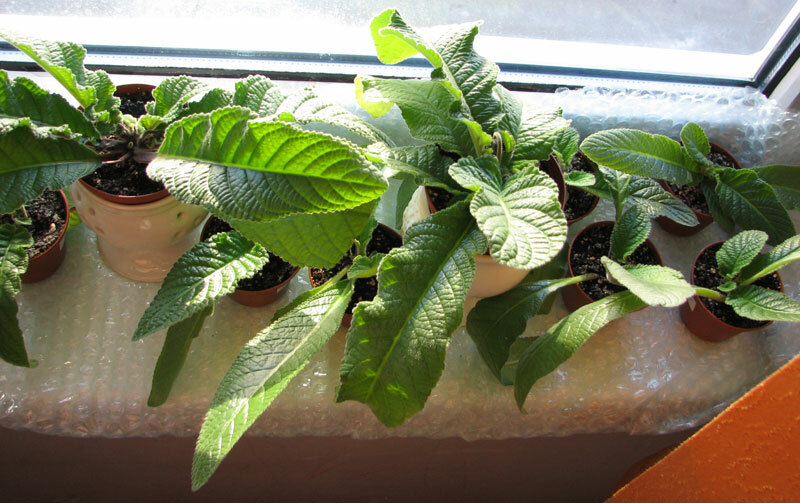 In the beginning of winter I put some streps on the windowsill. I have not re-potted them. They look great now. Photo was taken in the beginning of winter"
this one in April. 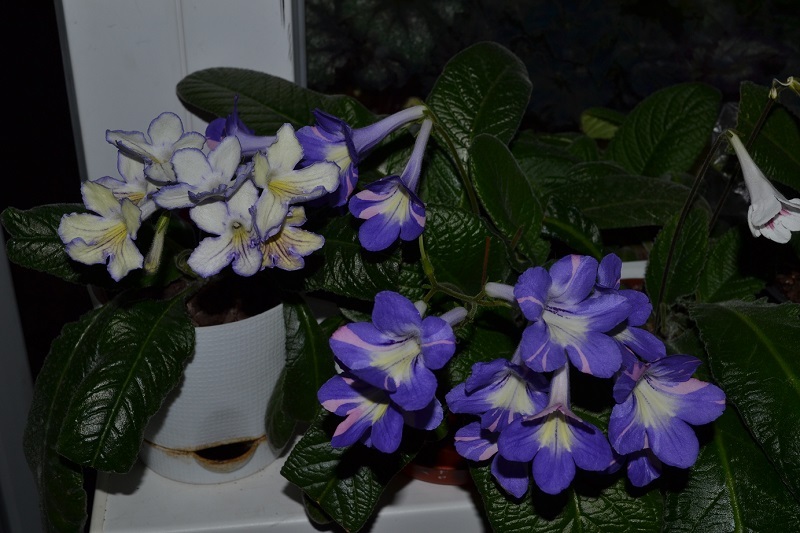 Suprisingly streps on the windowsill started to flower earlier than under the lights"
Another observation. I have another windowsill. It is much warmer there. 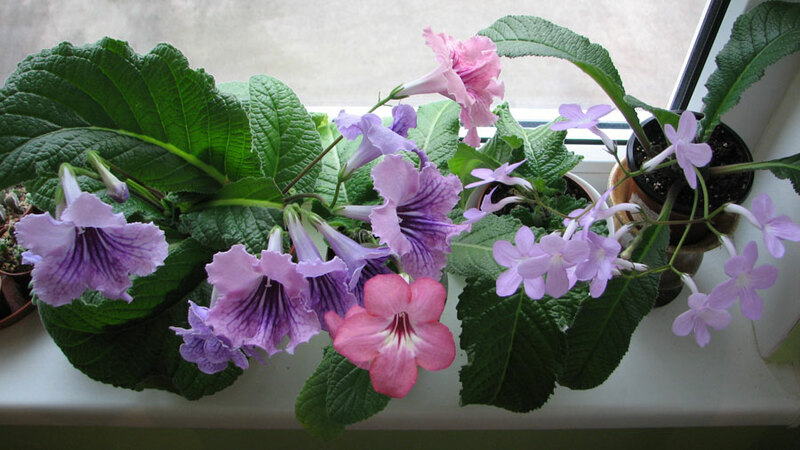 Streps that are on warmer windowsill started to bloom later." 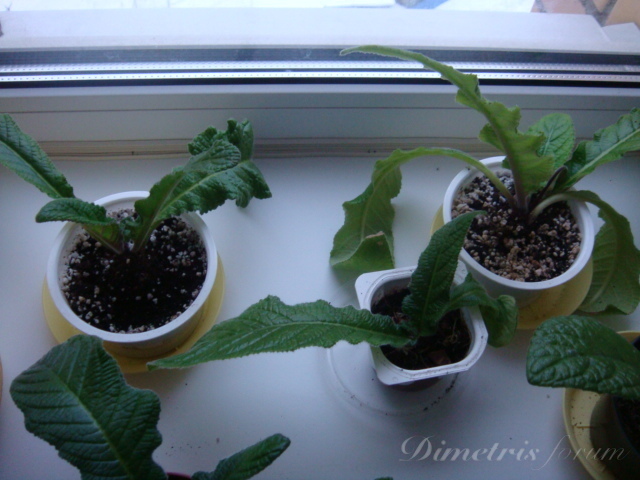 Ludok: "DS-OWL on my windowsill"
Alisa: "My one-year-old streps are in the pots. 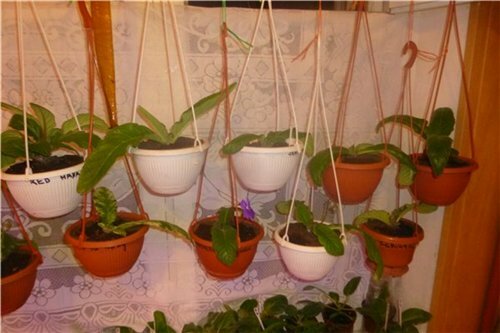 Two-year-old are in the hanging pots. Pavel: "Alisa, you streps are great. I have a questions. 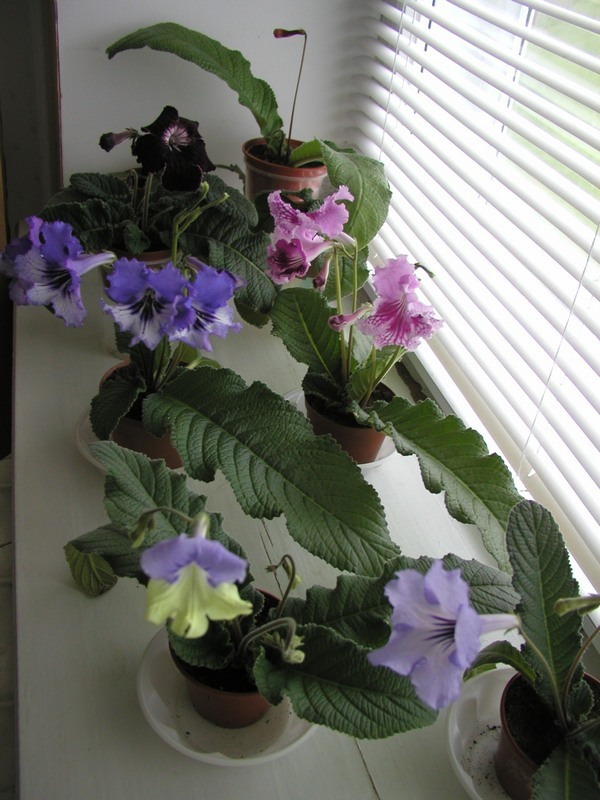 Do they all were grown on the windowsills without additional light. I saw you hanging steps without saucers. How do you water them?" Alisa: "Thank you, Pavel. 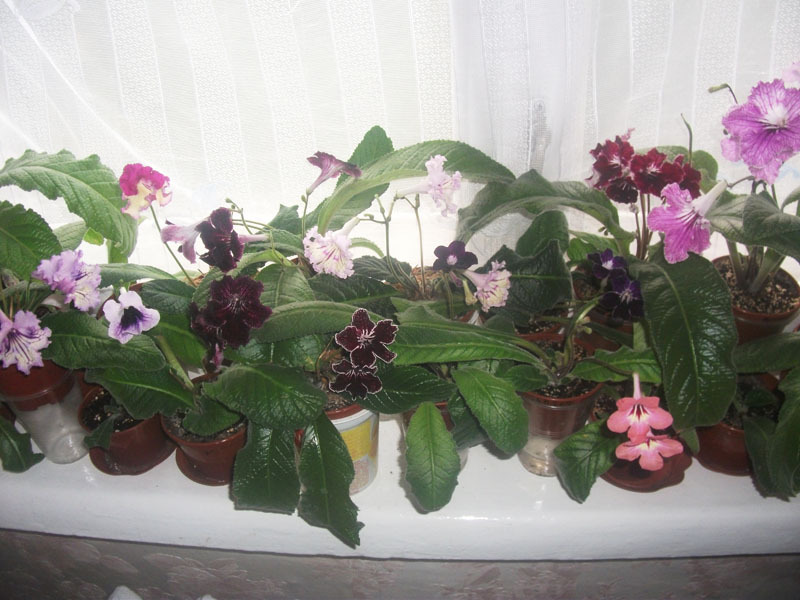 Yes, all were grown on my north-east windows. 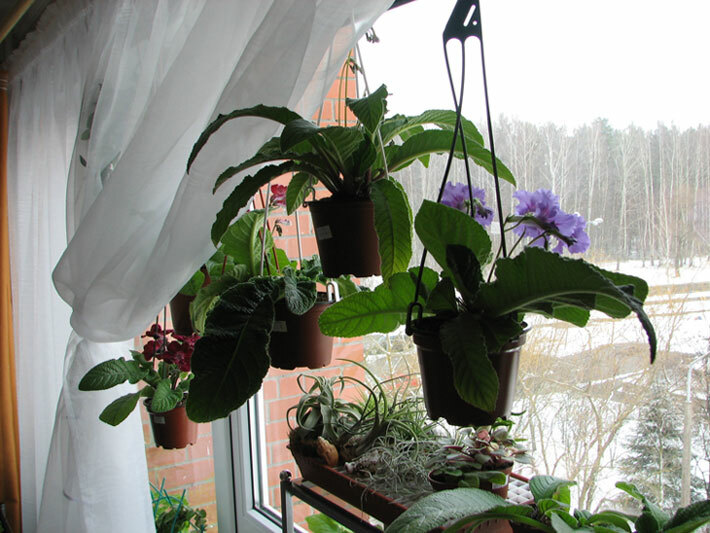 When I water my hanging pots I remove them from the window. To prevent soil coming from the drainage holes, I put sphagnum on the bottom of the pots. I am lucky, I have a great swamp near the place where I live:-))"
Pavel: " Mine finally started to wake up. Now they have more buds. NataliaH from Germany: "Unfortunately I can't show previous pictures. 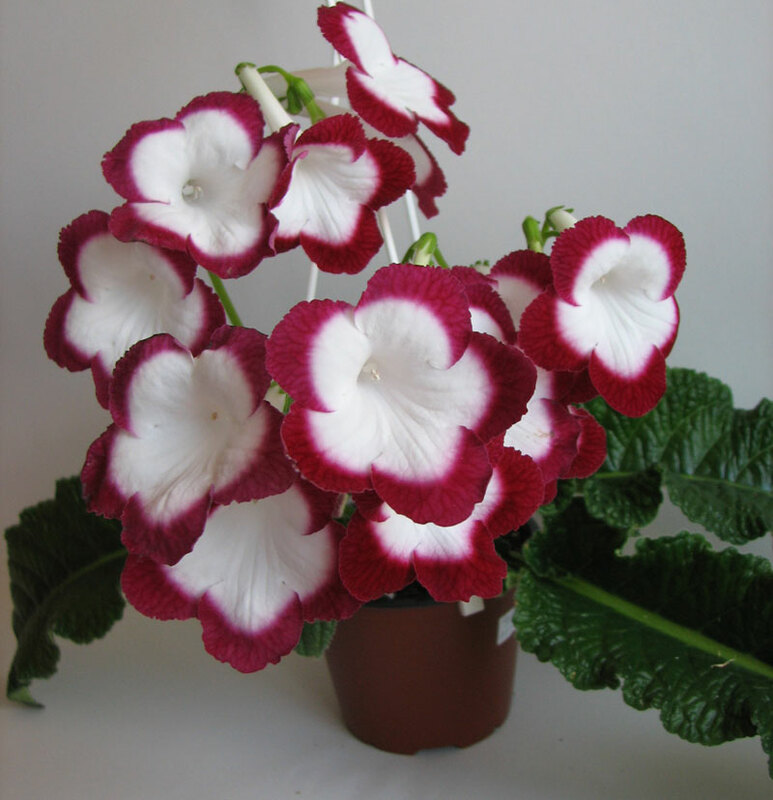 However, they all are grown without artificial light. I have north-east windows. Some is on the windowsill, some is on the shelf. 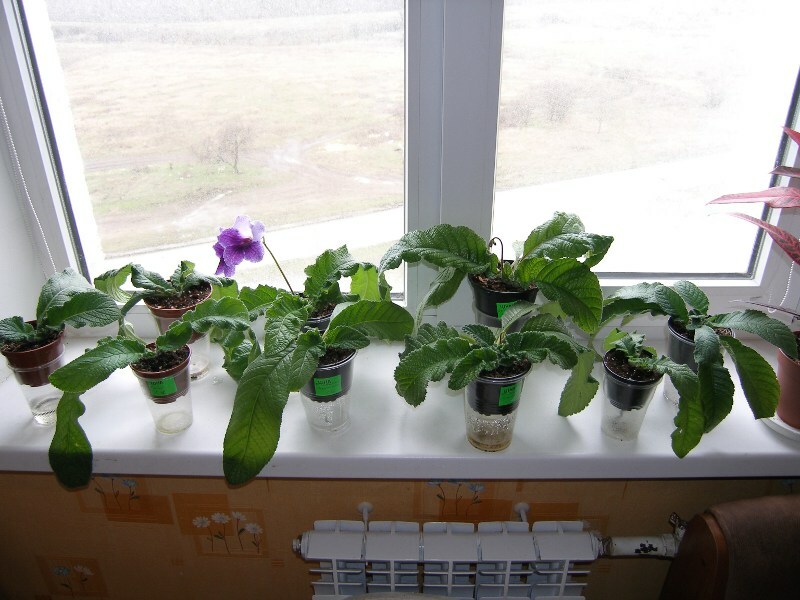 From left to right: "
Pavel: "I've realized that my window is very small and I they don't have enouph light. They all lean to the window. 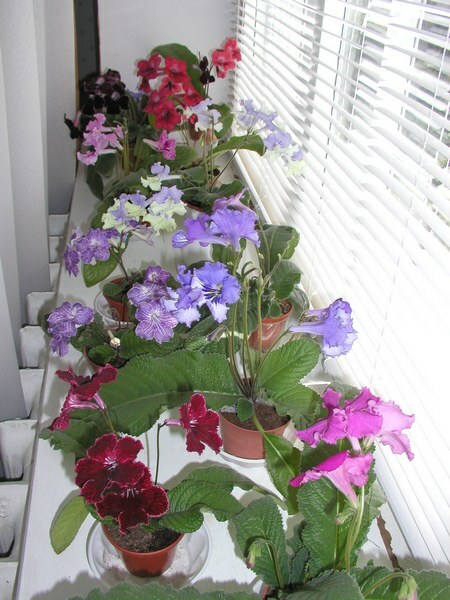 If they had stand neat the big window or, in the loggia (even better) they would have much more flowers. " 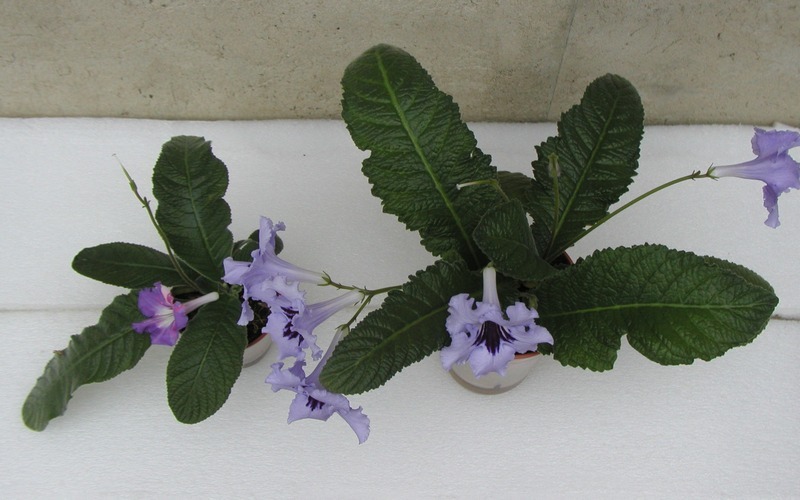 NataliaH: "Yes, but even in loggia where the light coming from three sides, I need to rotate the plants. Otherwise the rosette become lopsided. " 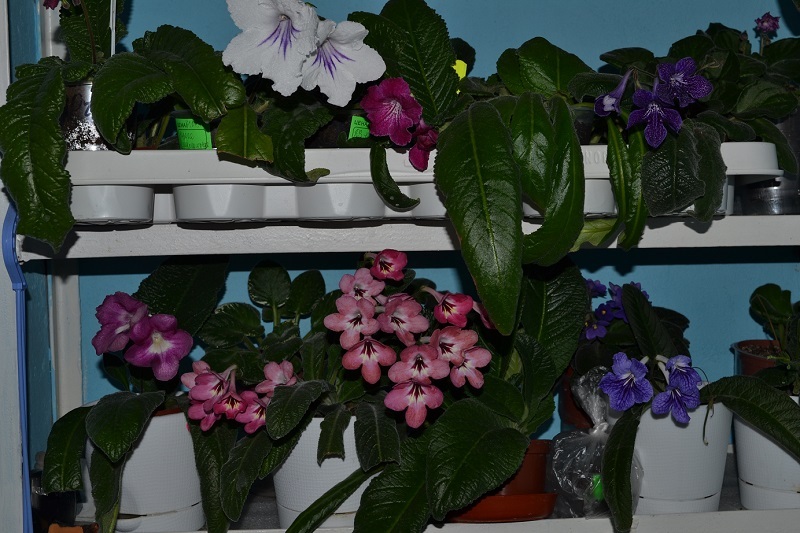 Forum: "Great shelf: from floor to the ceiling"
NataliaH: " Thanks, I am thinkng to install another one"
Tatmih: "Month ago they occupied half of the surface, now whole windowsill"
Forum: "Oh , my God!. 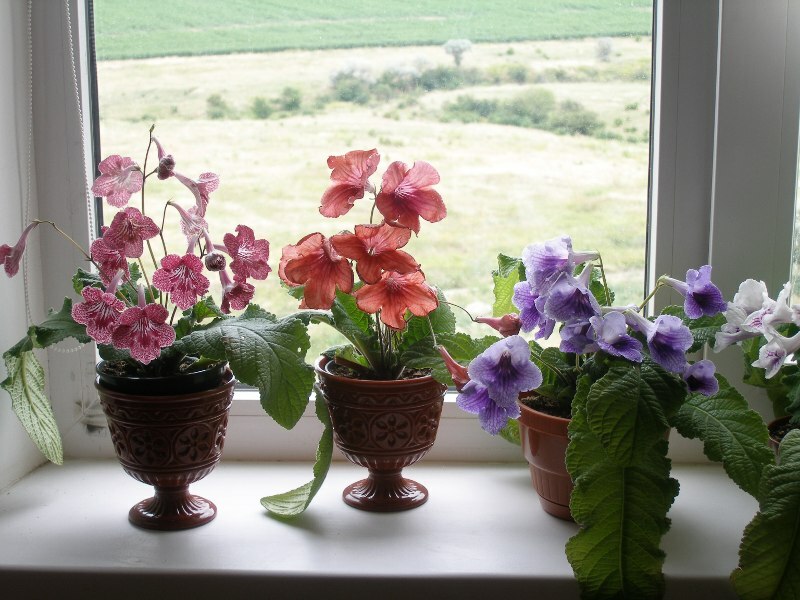 We want the same windowsill!" 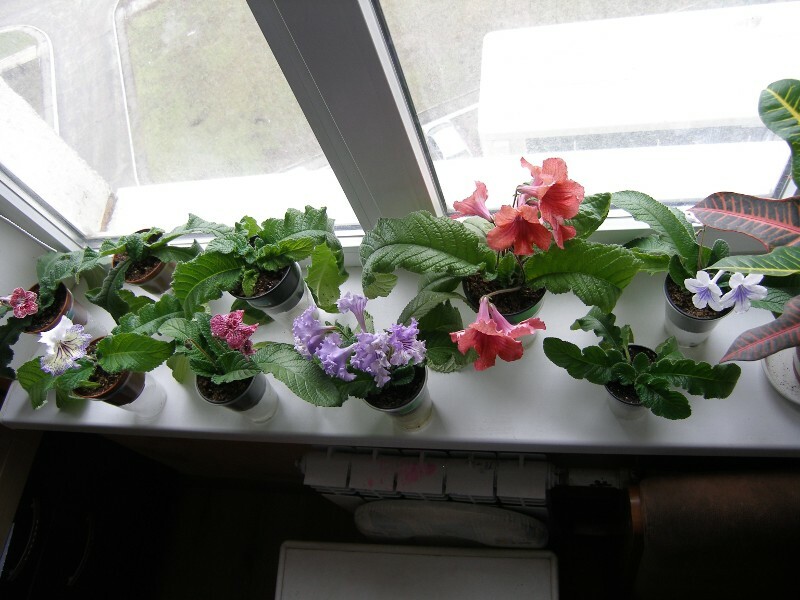 Olya: "Mine are flowering a little bit"
Alena: "Mine are not show plants, but I think they are OK. East window. 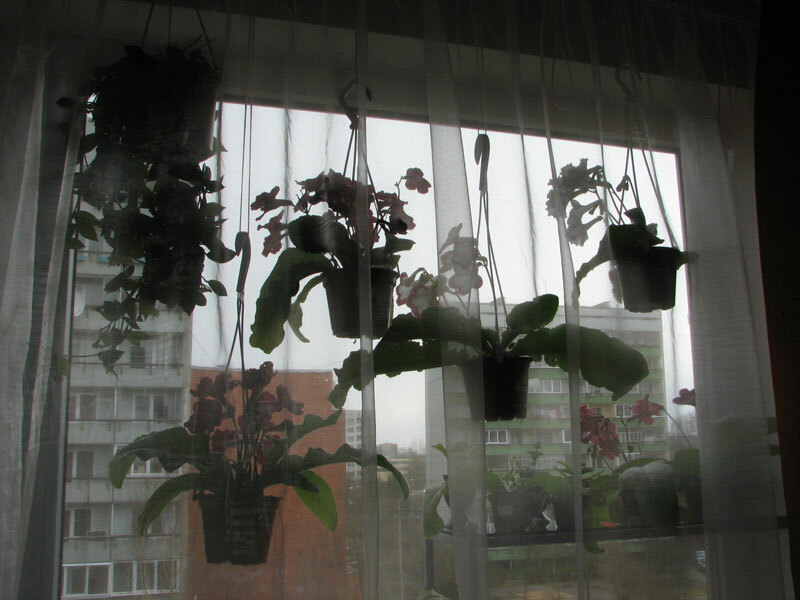 Six weeks ago I remove all buds, since I over-dried them. " 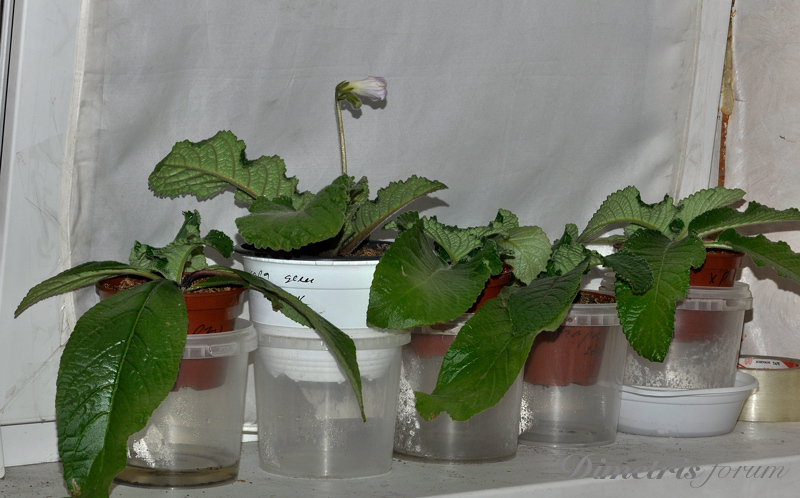 Nazan: "I have a very little experience in growing streps.They bloomed much better in May, but I was in the hospital. I could not photograph them. 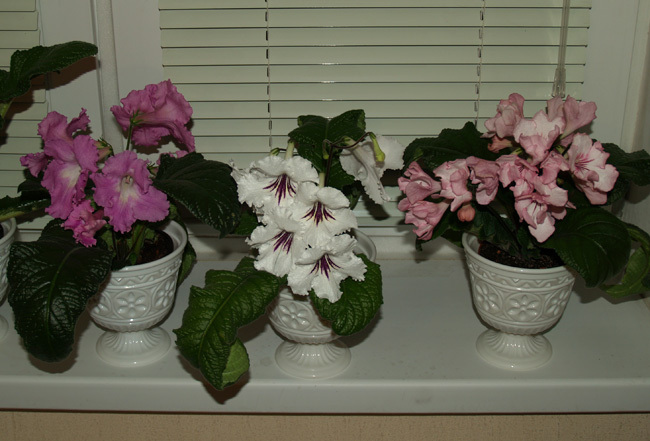 After month in the hospital, I re-potted some and remove peduncles, but the rest are still blooming a little bit. 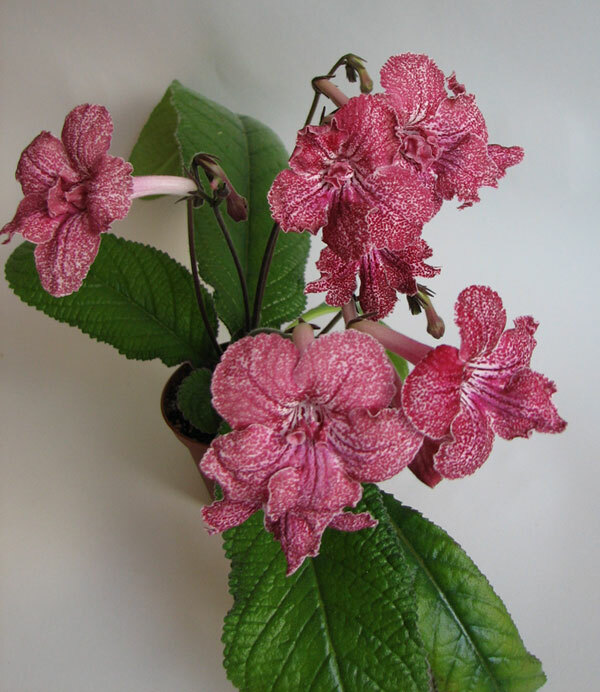 Radist57: "I also notice that DS-Owl has very long-lasting flowers. My DS-Owl has hat of flowers for about two months!" 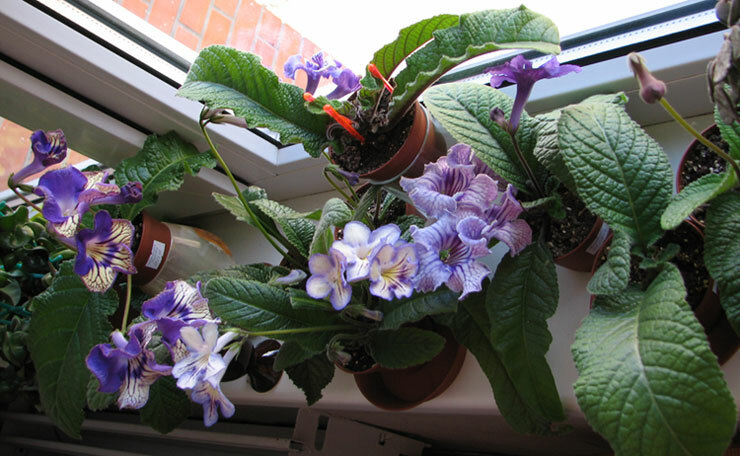 Lorik76, Germany: "I dont have windowsill, but something close"
Olya: "They are crowded, I know"
This was a great experiment, thank you for posting this translated version to this forum. As I have no artificial lights and use an art studio with windows on three sides, mostly east facing, this was of particular interest to me. 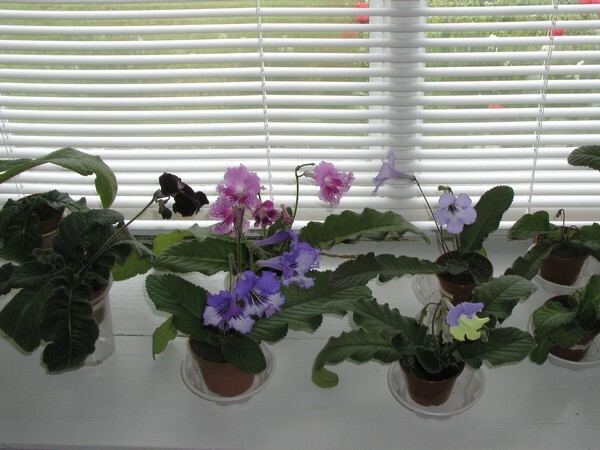 Oddly enough I get the MOST light in January and February before my trees leaf out, so that is usually my highest flowering period for both my orchids and my violets. 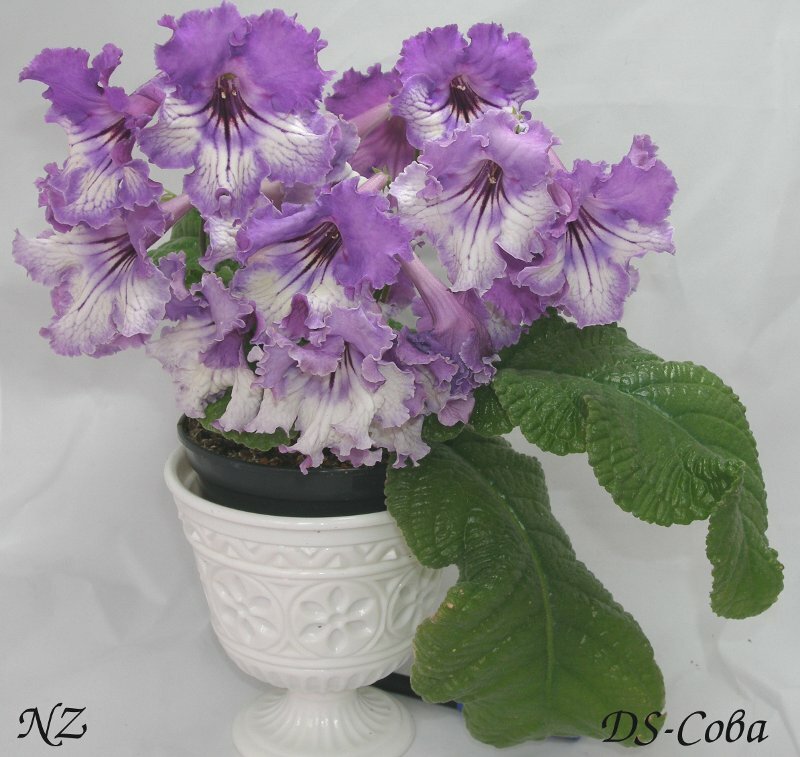 This is my first year with streptocarpus so it will be interesting to see how they do in winter. Also, the glass shelves are awesome. I am going to build something like that and try it out.